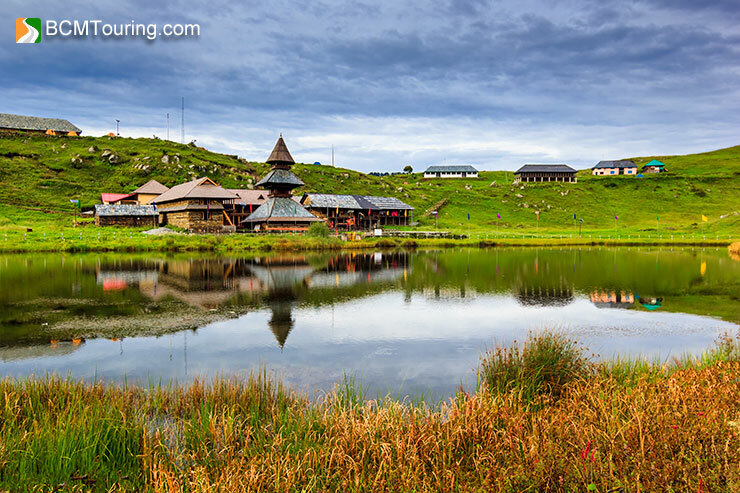 Prashar Lake is a beautiful lake located in the Mandi District of Himachal Pradesh at an altitude of 8,956ft and is an abode for nature lovers and pilgrims alike, and offers its visitors tranquility and beautiful views of the Dhauladhar, Pir Panjal and Kinnauri mountain ranges. Located 49km from the town of Mandi; as per the legend, Prashar Lake was formed when Bheem (one of the Pandeva brothers from Mahabharata) formed the lake by pushing his elbow and forearm on the peak of the mountain on the request of Deity Kamrunag, who liked the place so much, that he decided to stay here for the rest of his life. Lake itself got the name from Sage Prashar, who had meditated here. In 14th century, the then King of Mandi, Raja Ban Sen, built a beautiful three storied pagoda shaped temple devoted to Prashar Rishi. There is one road in and out of Prashar and connects it to both Mandi (49km) and Kullu (64km). While the road is single lane and in bad condition for last few kilometers, it offers pristine views of the entire valley and makes for a wonderful drive. Bus: Mandi is well connected to rest of North India by bus network and all buses traveling to Manali stop there. From Mandi there is a local HRTC bus to Prashar Lake, which leaves each day from Mandi at 8:10am and starts its journey back to Mandi from Prashar at 1:10pm. Taxi: You can hire taxi from Mandi (Rs. 2,000 for alto) to Prashar or from Kullu or Manali to Prashar or you can get seats in shared taxis traveling from Mandi to Prashar. However shared taxis are fairly limited in number during off season. Train: Nearest major train station is at Chandigarh, from there you can travel by bus to Mandi or hire a taxi to take you to Prashar Lake. Flight: Nearest airport is at Bhunter near Kullu and from there you can travel by taxi to Prashar Lake or travel by bus or taxi to Mandi and then take 8:10am bus to Prashar. Trekking: Several companies offer trekking tours to Prashar Lake, which begin from Baggi Village and is a fairly easy 7km trek to Prashar Lake, which can also be done without any support. Accommodation near Prashar Lake is fairly limited, since the area surrounding it is either owned by the temple trust or by government. Forest Rest House: Forest department has 2 guest houses located a little over a kilometer from the lake, and has 6 rooms available for tourists. For booking you can contact DFO Mandi at 01905-23536 and contact the caretaker, Mr. Roop Singh at +91– 9418411746. 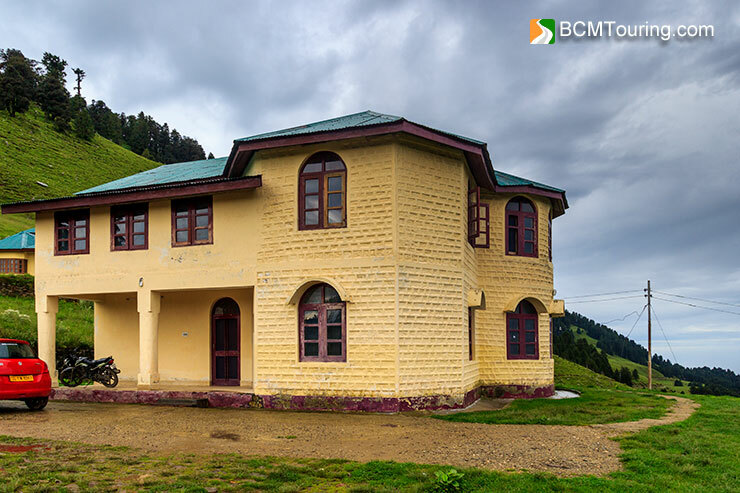 PWD Rest House: PWD Rest House too is located a kilometer from the lake and can be booked by contacting Executive Engineer, Padhar at 01905-222151. Temple Guest House: There are rooms and dormitories available at the temple, which can be availed for a minimum fee. These are bare basic in nature and you should be aware of religious sensitivities while availing them. Camps: There are several camps run on the temple ground, above the Prashar Rishi Temple by various companies. You can contact Neal Café +91-9459521851 for booking, which is run by the son of the caretaker of FRH. There are a few dhabas and tea stalls near the temple, which offer basic food. FRH and PWD Guest House caretakers also cook food for their guests and charge a small amount for it. Climate of Prashar Lake is pleasant throughout the year; though winter can be quite cold and road can get closed due to snowfall, making it impossible to reach to lake in vehicle and necessitating a trek through snow filled trail. 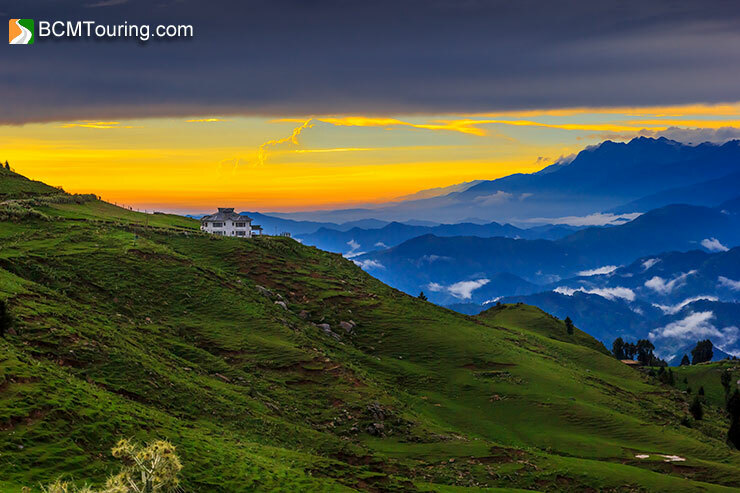 Monsoon season too is unpredictable, yet beautiful and even though the road can get closed temporarily due to landslides, bus as well as taxis continue to bring day trippers and travelers to Prashar Lake, even in the rain season. Prashar to Baggi, 7km downhill trek. Prashar to Kandi, 15km level walk. Prashar to Balu Inspection Hut, 18km level and downhill trek. Prashar to Thatta FRH, 10km downhill trek. Prashar to Piun. 12km downhill trek. Looks like a must visit location. Thank you for all the info. Just a question. How close can one reach Prashar Lake in an SUV. My problem being how far do i walk with heavy camers equipment. And is the walk uphill or level. 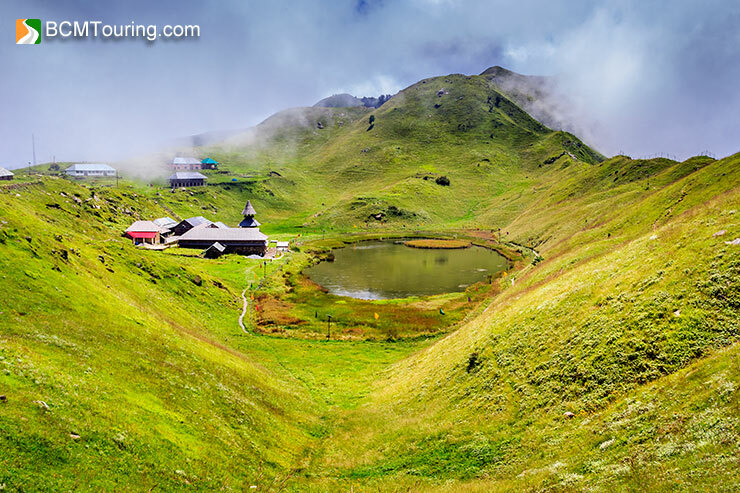 You have to trek for around 700-800 meter, in order to reach Prashar Lake from the road, initially it is uphill on a concrete trail, then it is downhill, with a part of it being grassy. You have to trek just 100 to 150 m…….that’s it…. Though been to the region no of times and also heard of this mytholologically famous lake yet to visit it. Now your beautiful writing compelling me to plan an early trip. Which should be the best time? Unless you’re interested in seeing snow, monsoon season is the most beautiful time to see the beauty of Prashar Lake. I alongwith one of my friend planning to visit parashar lake on 1-2 April’17. We have planned to start our trek from Devari village located at 6 Kms from Pandoh. can you help us about the trek condition and whether we can witness snow on or around lake during this time. I was there last week during mela, Having grown up in himachal i did not find it much interesting as the sights and views were very familiar and nothing new. Thought mela was a good add on. and we trekked from baggi 7Km uphill stayed 2 nights in the tent we carried and back downhill 7km. also ate some cauliflowers on the way back. Can I expect to see snow in Prashar if I go there on Christmas weekend of 2017 ? In all likelihood, yes. Though there is chance that the road up to the lake would be closed and you will have to walk for 7-8 km in snow.